The pace of global construction output growth is expected to pick up marginally in 2019, reaching 3.4% from 3.2% in 2018, before rising to 3.5% in 2020, says GlobalData, a leading data and analytics company. 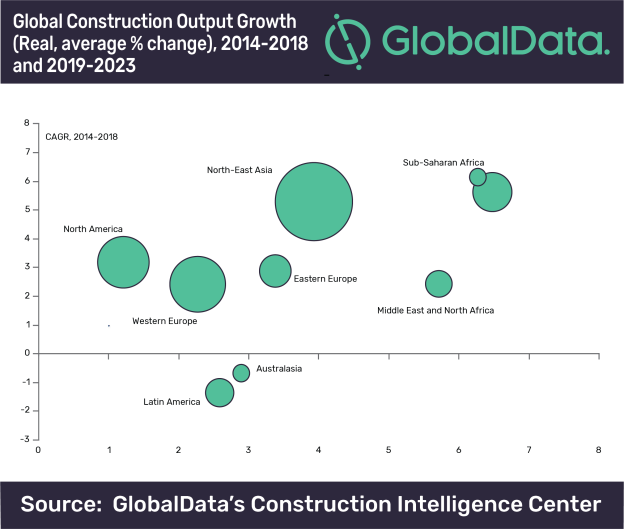 According to GlobalData’s latest report, ‘Global Construction Outlook to 2023 – Q1 2019 Update’, the improvement is entirely owing to an acceleration in growth in construction activity in emerging markets, most notably in China, where the authorities are stepping up investment in infrastructure to prevent a continued slowdown. However, growth in China will drop back from 2021 onwards, and this will contribute to a slight easing in construction growth in emerging markets. The pace of construction growth will ease in South and South-East Asia in 2019 following the sharp upturn in 2018, but it will be the fastest growing region in 2019–2023, with average annual growth of 6.5%. There will be sustained recoveries in construction output in the Middle East and Africa, as well as in Latin America. However, weakness in Turkey will pull down the pace of regional expansion in Eastern Europe.